This spacious three bedroom property is located on a quiet residential street in the popular traditional village of Emba. 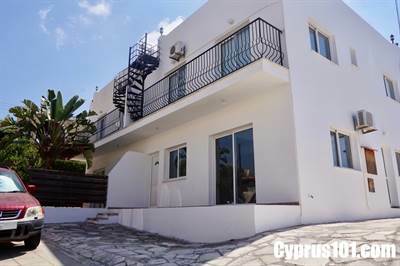 Paphos and the beautiful coast are within a few minutes’ drive away. A balcony to the front of the property can be reached from both the master and second bedroom via sliding patio doors. A spiral staircase leads up from here to a large, private roof terrace with fabulous sea and mountain views – a perfect spot to enjoy the wonderful sunshine and equally amazing sunsets.